manual focus-only lens. Please also note that the image depicts the Canon-mount version of this lens until official photos are published; this Nikon-mount (ZF.2) lens DOES have a manual aperture control ring. The Carl Zeiss range of T* ZF.2-mount lenses offers high standards in terms of performance, reliability and, of course, image quality. You can count on highly advanced flare control for crisp and brilliant images. And virtually zero geometric distortion, ensuring precise accuracy when reproducing shapes, especially useful when photographing products and architecture. 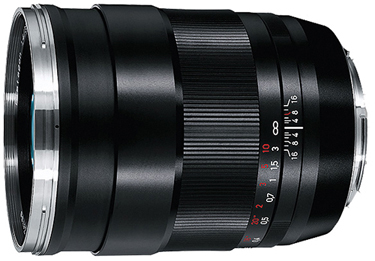 The Zeiss 35mm f/1.4 T* ZF.2 is great for low light situations and has incredibly precise focus ability. Thanks to the floating design, image quality remains almost consistent from the close-up range to infinity. This lens is ideal for shooting beautiful portraits with a smooth blurred background and is also great for shooting video because of the wide focal range and smooth focus ring. 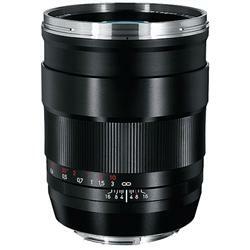 • High image quality in the close-up range makes this lens ideal for still life photography of small objects. • Control of flare and ghosting are outstanding, so that even extreme highlights in the image field do not affect the quality of the image. • Precise mechanism enables exact manual focusing. • Carl Zeiss T* lens coating. Lens rental package includes: Front cap, rear cap, and UV filter.